Bring stock to boil. Add all ingredient (minus parsley and noodles). Turn down to simmer. Simmer for approx. ½ hour. Add noodles 5mins prior to serving, Add parsley 2mins prior to serving. This is a salad I first tried out of a recipe book cuz I was having weird pregnancy fetishes. Not normally a dish that I would have tried, but I’m glad I did cuz it’s YUMMY. I made it for Alexander and even he enjoyed it, despite the high proportion of rabbit food! 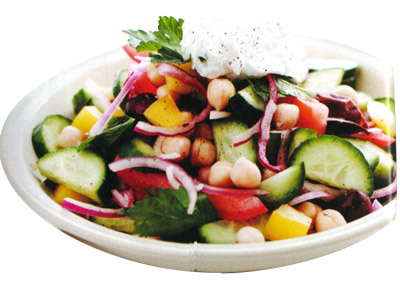 Combine chickpeas, cucumber, onion, olives, parsely, capsicum and tomato in a medium bowl. Combine ingredietns for dressing in screw-top jar, shake well. Toss dressing with salad. Top with tzatziki. I’d never made a lasagne in my life till recently, and this is a really yummy vegetarian lasagne which I have also adapted to non-vegetarian version. I was surprised to discover that lasagne is easier to cook than I realised! Tomato sauce: Heat oil, add onion, mushrooms and capsicum, cook and stir over high heat until onion is tender. Add herbs, undrained tomatoes, tomato paste and sugar. Bring to the boil, reduce heat, simmer uncovered for 30 mins, stirring occasionally. Spinach layer: Heat oil in pan, add garlic, spinach and shallots. Stir fry until spinach is wilted, about 3 minutes. Drain away as much liquid as possible. White Wine Sauce: Melt butter in pan, stir in flour, cook for 1 minutes stirring. Gradually stir in white wine and milk, stir over heat until sauce boils and thickens, add cheese and stir until melted. Pour half the tomato sauce into a lamington tin or overprood dish (16cm x 26cm). Place a single layer of the lasange sheets over tomato sauce, then spinach layer, then cheese layer. Top with a second layer of lasange sheets, then remaining tomato sauce. Pour White Wine sauce over tomato sauce. Bake uncovered for 30 mins in moderately hot over or until top is bubbly and beginning to brown. Hints: Prepare the day before as required, cover and refrigerate, bake 45 mins before ready to serve. Stand 10 mins before cutting. Make 3 quantities to serve 25 guests. For the non-veggie version I just added mince to the tomato sauce layer. I also didn’t use quite all the ingredients, I modified some things slightly cuz I was lazy and some ingredients I didn’t have, but it was still yummy!